Isn't he handsome? We adopted Mr. Higgins (below) from an animal shelter when he was about 2 years old. He is approximately 11 years old now. We were not sure of what breed he might be, but our vet has told us that Mr. H. could very well be a wire-haired dachshund. He has been a ton of fun and we love him dearly. Mr. Higgins grew old and tired. He had become deaf and almost blind and was beginning to lose control of his bladder and bowels. Then he became so filled with fear (we think because of his not being able to see or hear), that he whined and would refuse to move from the spot he was on. He became depressed and his appetite slowed way down. 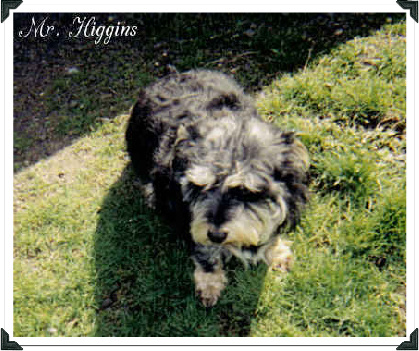 On May 23, 2006, we had to help him to cross over the Rainbow Bridge. It wasn't a decision made lightly or because we didn't want to have to take care of him. We knew he was miserable - not even a human would want to suffer the fear and shame (for pottying on the floor) that he did. We based our decision on what we thought Mr. Higgins would want us to do. Before he left to go to the vet clinic, he was bouncing around and truly happy. It was if he knew somehow... I spent a little time alone with him and I told him how much I loved him and all the joy he had brought into my life. I thanked him for being so special and I told him that I would miss him terribly. I also told him to wait at the Bridge for me and then we would be together again forever. I miss him very much, but I see him in my dreams and that helps so much to ease the pain. He was truly a blessing to his dad and myself. always wanting that pot of gold. of just a small creature to hold. and know what devotion is worth. you're the richest person on earth. bright sun to palest moon. and faithfulness that's stilled too soon. as fleeting as a baby's smile. So give them all the love you have. They're only ours for a little while. that burn so briefly in our sky. you'll see their light forever shine.